What impact, if any, does the Easter holiday have on the market? A previous post looked at the behaviour of the market around holidays (sometimes referred to as the holiday effect). In this post we will narrow the focus to look at the behaviour of share prices around the Easter holiday. 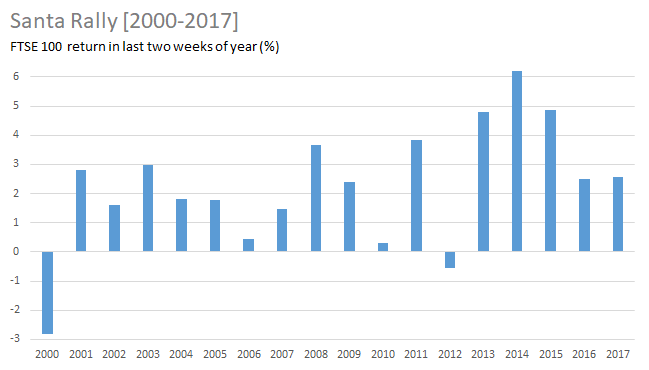 The following chart shows the average daily returns for the FTSE 100 Index for the four days before, and three days after, the Easter holiday over the period 1984-2013. The general profile of behaviour around Easter is similar to that seen before for all holidays. 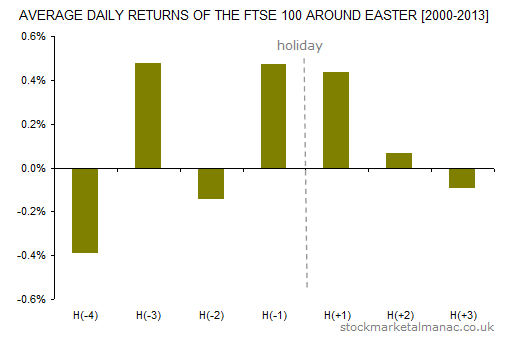 The main differences are that H(-4) is significantly weak, and the average returns for the two days immediately before and after Easter are significantly higher than for all holidays. 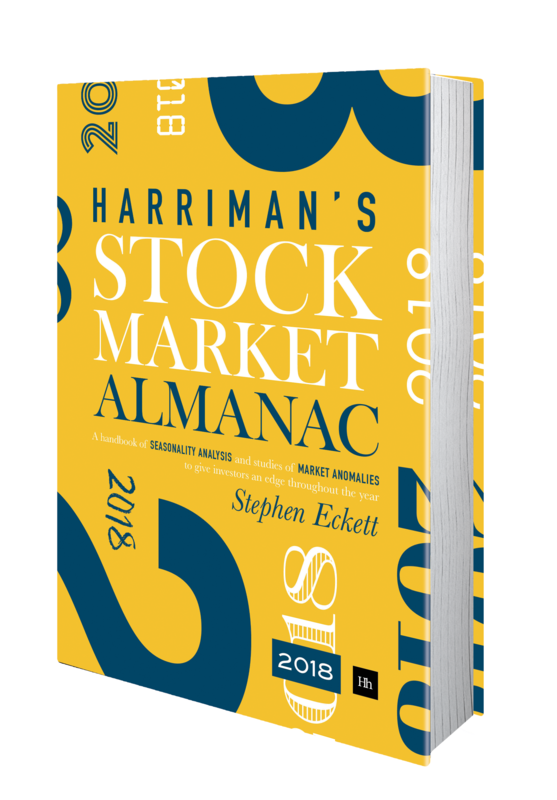 For example, the average return for H(-1) is 0.4% (13 times greater than the average return for all days in the year); for all holidays the figure is 0.2%. 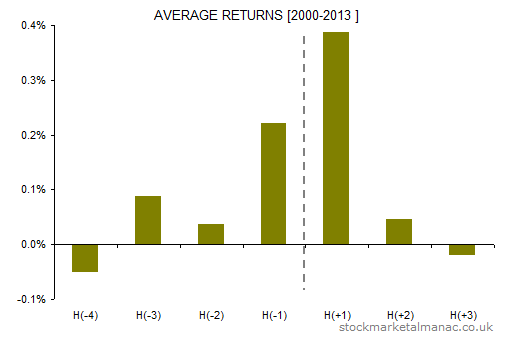 The standard deviation for the Easter H(-1) average return is also significantly low. The following chart is similar to the above, but this time the period studied is 2000-2013. This second chart suggests that the behaviour of the market around Easter has not changed significantly in recent years. An academic paper (Ariel, 1990) was published with the finding that the trading day prior to holidays in the US market had an average return 14 times greater than the average for the other days in the year. 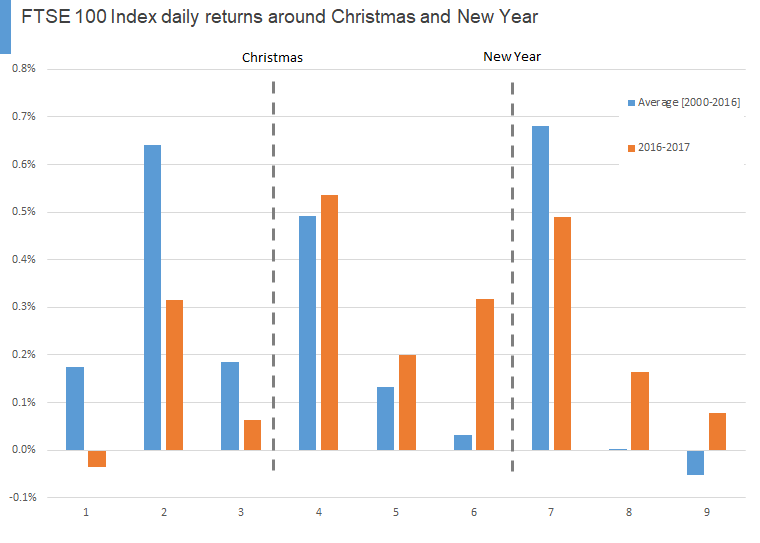 This, and other papers, found that the day immediately before holidays had the highest returns (in the period around holidays), with the third day before the holidays having the next highest return and the day following the holiday having negative returns. More recently this was updated in a paper (Ziemba and Dzahabarov, 2011) that found that the holiday effect had diminished in the 1990s and 2000s and that the out-performance was occurring largely in just the third day before holidays. Does such a holiday effect exist in the UK market? 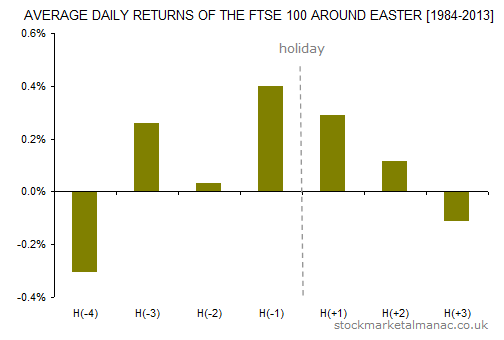 The following charts show the results of analysis of the daily returns of the FTSE 100 Index around holidays. The days studied were the four trading days immediately prior to holidays, H(-4) to H(-1), and the three trading days after holidays, H(+1) to H(+3). A holiday was defined as a 3-day (or longer) period with no trading. 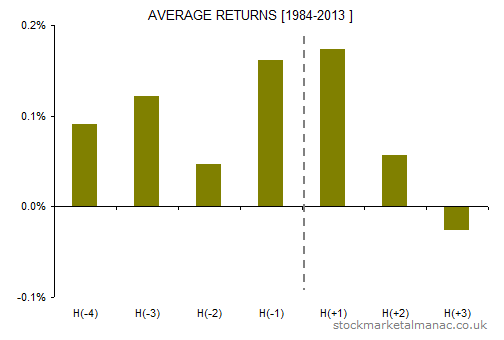 The following chart shows the average returns for the seven trading days around holidays for the period 1984-2013. We can see that, as with the US studies, H(-3) and H(-1) were strong during the holiday periods. 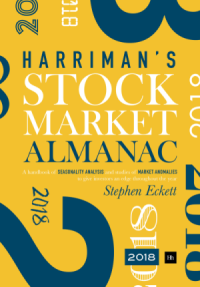 Although, unlike the US studies, the day after a holiday, H(+1), was also found to be strong – this day has an average return of 0.17% (six times greater than the average return for all days in the year). 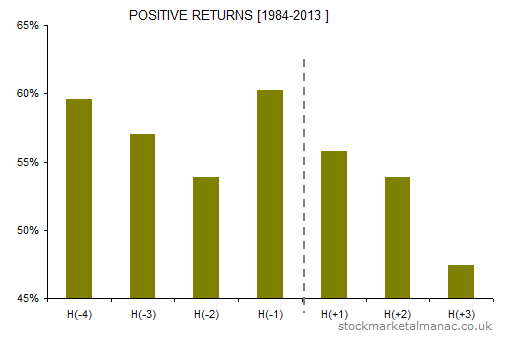 The following chart shows the proportion of positive returns for the same period. 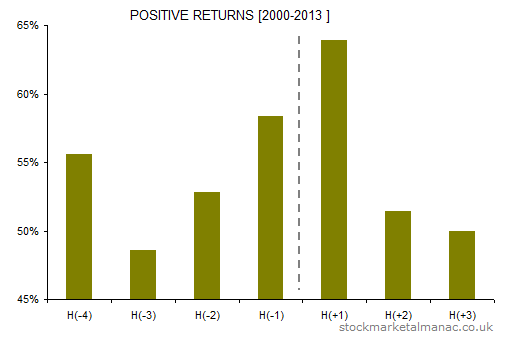 The profile is broadly similar to that for the average returns: H(-1) and H(-3) are strong, as is H(+1). The weakest day around holidays has been H(+3) – the only day with a negative return and proportion of positive returns under 50%. To look at the persistency of these results, the following charts restrict the study to the more recent period 2000-2013. It can be seen that the UK holiday effect has changed slightly in recent years.H(-1) is still relatively strong, H(-3) less so, but the main change has been the relative strength of H(+1). March is a middling month for the market, ranking sixth of all months in performance. In the last 43 years, since 1970, the market has risen 28 years in March (a rate of 65%), with an average return of 0.7% in the month. Strong sectors this month tend to be Industrial Engineering, Aerospace & Defense and General Retailers; while weak is the Gas, Water & Multiutilities sector. Historically, medium-sized companies have performed marginally better than large companies in March. 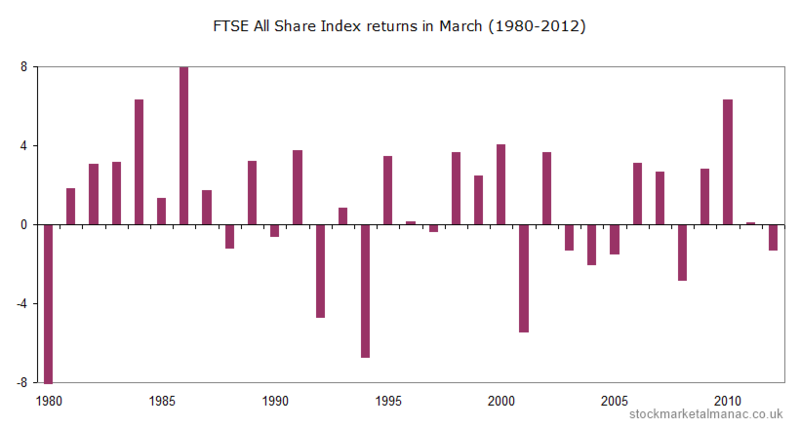 The following chart plots the percentage returns of the FTSE All Share Index for each March since 1980. For example, last year in 2012 the market fell 1.4% in March. As can be seen, although on average the market increases in March, there have been the occasional large falls. The general trend for the market in March is to rise for the first three weeks and then fall back in the final week (in fact, the final last week of March has historically been one of the weakest in the whole year). The year’s first quarterly review of the FTSE 100 Index will take place on 6 March. This is when the index is re-balanced and companies can be added to the index (following which their share price often falls) or ejected from the index (following which their share price tends to rise). It is difficult to predict the outcome of the review a few weeks beforehand, but just at the moment companies looking possible candidates for ejection are Serco, Melrose and John Wood, to be replaced by easyJet, London Stock Exchange and Direct Line Insurance. The first Triple Witching (when the expiry of futures and options converge on the same day) of the year takes place on 15 March. Volatility can increase around this day, while in recent years the return on the FTSE 100 Index on the Triple Witching day itself has been significantly greater than other days. Easter falls at the end of the month (the LSE will be closed 29 March and 1 April), when we might see an interesting market anomaly called the holiday effect. Academic studies have found that the market tends to be abnormally strong on the days immediately before and after holidays. The big economics event in March will be the chancellor’s Budget, scheduled for 20 March. The other significant date of the month will be the 7 March MPC interest rate announcement at 12 noon.